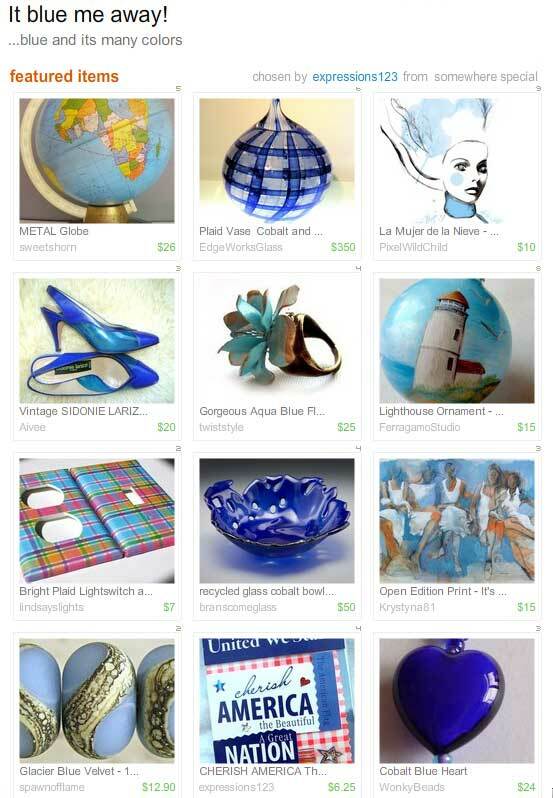 Some of my beads are featured in this blue treasury by expressions123 on Etsy. I was contacted a while ago to be interviewed for an article about Etsy artisans to be published in the Bath Country Journal, our local community magazine. I had not heard anything until this week, when a photographer called and said that the pictures for the article had to be done by Thursday. Well, that was a surprise! The photographer wanted a photo with me holding my beads, so to display as many beads as I could, I came up with the idea of using some cigar bead boxes that I had purchase a long time ago from The Bead Box Man. I like how the beads look, but we’ll see how I look trying to hold them in the photo. I was really worried that I was going to dump them all during my photo shoot! They stayed in the boxes – what a relief! Rosemarie Hanus makes many beads in her home studio. Take a look at these beads at Etsy, Art Fire, or my Spawn of Flame website. My beads are in another treasury. This one is called Olives at Midnight, curated by paisleykitty. I think treasuries are usually so wonderful to look at… I think that I may be inspired to make some olive green and midnight blue beads – but not right now, it’s only 37 degrees F in the studio. The curator, paisleykitty, is a buyer and is totally sweet creating treasuries. On Etsy, there are groups of people that promote each other’s shops – these groups are called Street Teams. I am on one such team; we all all lampworkers ( or flameworkers) that frequent an online forum called Lampwork Etc. Maybe I’m getting ahead of myself! Etsy is an online selling venue that can best be described by their tagline – “Your place to buy and sell all things handmade”. Back to our team. We have a website (Lestbeads.com) , a blog (Welcome to LEST), an area on Flickr (Lampwork: Glass Beads), and probably some others. Update: sadly, this team is no longer in existence. We run promotions each month, and for the month of December we are having a Holiday / Winter Challenge. Several members have uploaded photos of beads and you can vote on your favorite. Go ahead. Go vote. Go do it now! I wouldn’t mind if you happened to vote for mine. When the call for entries for the next Bead Review was announced, I decided that I would submit three of my beads for consideration. 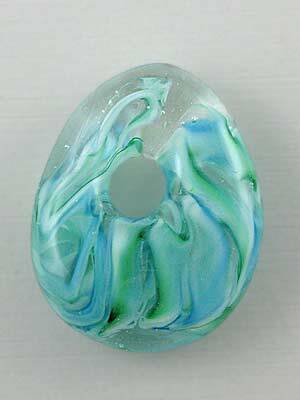 I had submitted some of my work for the first one, and one of my lampwork beads was selected. I slacked off and did not send anything for the second one. Well, today is the very last day to get entries in and I am having a hard time deciding which beads to choose. I am pretty sure that I have finally decided. I can’t show the ones that I am sending, but here is one that did not make the cut. It is a great bead, but it is one that looks so much better in person that I had a hard time submitting it. That, and the background was too sharp in the original photo (before the gaussian blur on this one!) – we are not supposed to edit the photos. Hey, whatever selection method works, right?